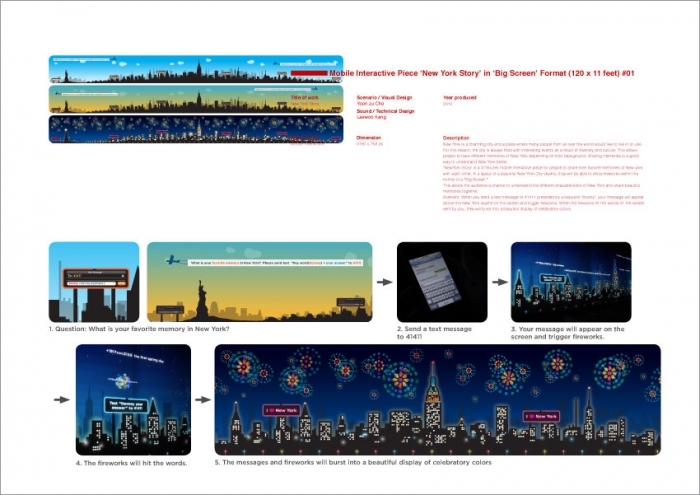 The project ‘New York Story’ is an mobile interactive video for the Big Screen in the IAC building in which people can share their favorite memories of New York with each other. The basic idea of this project is derived from the question, "What is your favorite memory in New York City?" Being in New York, where the world’s culture and art flourishes most, enable people to have exciting memory with enlarging their cultural perception. We intended to collect and share their favorite and unique memories with other people by using everyday mobile device. 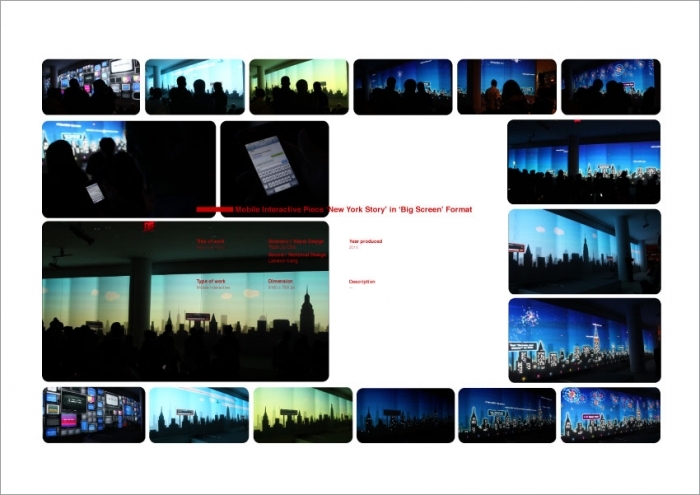 This interactive video is created for IAC's Video Wall, one of the largest video in the world, 120 feet x 11 feet wall. The user can send their favorite memory in NYC to assigned number. Their messages are displayed on the video wall. Fireworks, then, is created to the messages with music, which means celebrating the memory. Technically, three computers are utilized for projecting the video in IAC video wall. One computer is used as a server collecting sms messages from mobile server(TextMark) and transmitting mobile and OSC data to three displaying computer. All computers are connected through internal network. When each firework goes off, MIDI message is created and playing C-major scale music.